The Conservative Party of 2015 may be an ideologically confused shadow of its former self, but one instinct remains undulled: the hard-headed (some might say recklessly regicidal) way in which senior figures quietly position themselves, ready to quickly and ruthlessly dispatch their leader as soon as he or she is judged to have become an electoral liability. Some have suggested that there are plans afoot to launch a “Keep Cameron” movement in the event that the Prime Minister fails to win the Conservatives an outright majority for two elections on the bounce, and fails to cobble together a workable coalition to keep the Tories in power. But this is extreme wishful thinking – David Cameron can barely muster the passion and commitment to conservatism to convince the British people he truly wants a second term, let alone that he has any bold new plans up his sleeve. If he struggles to show that he wants to remain Prime Minister after 7 May, he certainly will not want to return to the thankless job of being Leader of the Opposition. And now many Tories, eager to avoid a prolonged and damaging internal power struggle should Cameron go, are agitating for the swift coronation of London Mayor and Uxbridge parliamentary candidate Boris Johnson. Most of this is good stuff, red meat for true conservatives. Anyone who can mount a spirited attack on Labour’s politics of envy and the left’s sneering hatred of personal independence and success is surely an asset to the Tory party, particularly when the current leadership seem more determined to pose as Labour Lite, competent technocrats best placed to run Britain’s public services and no more – or Coke Zero Conservatives, as this blog has taken to describing them. But what’s all this about “lead[ing] in Europe”? This is a very deliberate and curiously specific turn of phrase. Why should Britain lead only in Europe? Why not seek to reclaim and amplify our position of economic and diplomatic leadership in the world? He suggested the UK could negotiate a “generous exit”, giving access the European common market without the current political ties, saying: “And that combination of a lower regulatory burden and undiminished trade access would cause exports to boom, and the whole thing would be turbo-charged by new trading agreements with major partners such as China, Brazil, Russia, Australia and India. So is Boris Johnson’s sudden downgrading of his ambitions for Britain to play a leading role only in Europe, not the world, evidence of a politically calculated change of heart? It could well be, given the fact that he has apparently undergone a similar, conveniently timed conversion in his approach to the question of wealth inequality. Even if David Cameron crawls over the finishing line and remains prime minister it will be the fifth successive election at which the Conservatives will have failed to win a majority. Boris thinks he knows why. He fears the Tories are doomed if they continue to be seen as defenders of the rich and, particularly, the privileged. He argues that “the wealth gap has been allowed to get too big” and is now “outrageous”. You can’t imagine him saying this even a year ago. In fact he said almost exactly the opposite — arguing that inequality was a generally good thing because it raised living standards for everyone. He has also been a serial defender of the City’s bankers. He now seems to have modified his tune. The mayor wants every firm to pay the living wage. That equals £7.85 across the UK; £1.35 more than the minimum wage. Unlike the minimum wage, the living wage is voluntary, but Boris thinks firms should not be able to apply for government contracts if they don’t pay it. Many Tories won’t agree with the specifics of Boris Johnson’s flagship policy idea, but few should question that their “party of the rich” problem is getting worse rather than better. In 2010, 78 per cent thought the Conservatives were too close to rich people. Remarkably, that number is even higher today: at 85 per cent. Despite George Osborne’s enormous efforts — which include the bank levy, top earners contributing most to deficit reduction, and repeated ministerial pay freezes — voters aren’t convinced that “we’re all in this together”. While much of this is laudable, these words also contain the essence of why Boris Johnson should never accede to the Conservative Party leadership, let alone to the office of Prime Minister. Johnson talks about the wealth gap having been “allowed” to get too big, as though it were the role of some supervising authority (government, naturally) to intervene to prevent this from happening. And although the Spectator interview made clear Johnson’s preference for empowering the poor rather than kneecapping the rich, it is also now clear that he has no qualms about rolling up his sleeves and indulging in some big government-style meddling to produce the “desired outcome” where necessary. The Mayor of London has demonstrated an eager willingness to use the power of the state in other areas, too – such as allowing the police to suppress future large-scale protests with water cannon, a policing tactic never before used on the British mainland. In fact, so eager was Johnson to take this step – back when it was still fashionable to take a tough stance on anti-Austerity protesters rather than trying to appease them by looking and talking like the Labour Party – that he went ahead and spent public money purchasing water cannon with no guarantee that the Home Secretary would ever approve their use. Speaking on Sky News, Mr Johnson said: “In many ways the guys who did this kind of thing are very often at the fringes of criminality, lured into terrorism by very cynical and clever idealogues. In many ways they are vulnerable to all sorts of criminality. “You have got to have a very tough security solution, to be absolutely determined to monitor these people, know where they are, know who they’re talking to. “I’m not particularly interested in this civil liberties stuff when it comes to these people’s emails and mobile phone conversations. If they are a threat to our society then I want them properly listened to. The obvious problem is that “these people” could potentially be anyone. The current laws may well permit mostly well-intentioned people to monitor mostly genuine suspected extremists, mostly for the good of the country. But the same laws could just as easily be abused by a new government or rogue operator for far less altruistic motives. Once the apparatus and legal framework to conduct mass surveillance of the population is in place, it would take very little encouragement – say, another 7/7 style attack in London – for the British people to become targeted for surveillance in a far more general way. 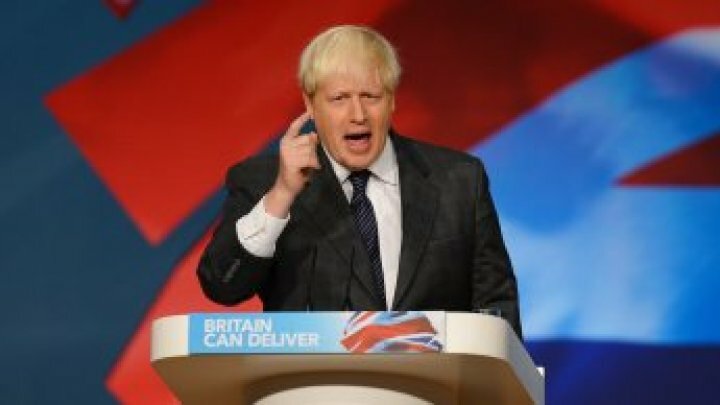 But despite these real concerns Boris Johnson clearly sees any limits on the intrusiveness of the security services – or the establishment of rigorous standards of evidence which must be met before intercepting people’s communications – as petty and unwelcome hindrances to the work of the security services, whom he would give carte blanche to operate as they pleased. In some areas, Boris Johnson is clearly happy for the state to loom very large indeed. And yet Boris Johnson is not all bad. In fact, this blog readily concedes some of his better qualities, including his “man of the people” persona. But this is not enough to make a good Conservative Party leader, let alone a good future Prime Minister. Boris Johnson’s political views seem to shift around, tilting with the prevailing political weather, and it is incredibly hard to pin him down to any discernible political philosophy other than the fact that he decided to play for Team Blue when he entered the world of politics. Johnson gets away with this lack of core conviction because it remains hidden and smoothed over by his bumbling, seemingly honest persona. When so few politicians are able to speak from the heart we naturally warm toward those who can – even though in the case of Boris Johnson, his head and heart tend to vacillate between multiple contradictory positions, almost overnight. Britain has had enough of politicians who don’t seem to believe in anything – or whose politics fall within the same incredibly narrow range of contemporary acceptable opinion, despite representing parties that claim to be polar opposites of one other. In fact, this is one of the main reasons why the 2015 general election campaign has been so stupefyingly clinical and boring, and why many Britons will not even bother to vote on 7 May. It’s not enough just to be someone with whom voters might want to grab a beer, or share a boozy Sunday pub lunch. Boris Johnson exudes this charm and “regular guy” appeal in spades, but there is absolutely nothing in his record to give the British people confidence that the self-deprecating old Etonian they vote into office one day will not become the world’s most affable tyrant the next, squashing our ancient civil liberties like grapes for a barrel of his Château Margaux in the wake of the next, inevitable terrorist attack. Boris Johnson is a major asset to the Conservative Party, one of their few big names with genuine, broad-based appeal. If the Conservatives remain in government after 7 May he should be given a prominent cabinet position which befits his intelligence, skillset and popularity (just so long as he is kept far, far away from the Home Office or any national security briefs). But Boris Johnson can not, should not, must not ever become Prime Minister. Previous Article What Kind Of Politician Has To Enshrine Their Own Promises In Law?